I had originally planned to do a post today on the history of Memorial Day, but in my search for information I discovered “The American Presidency Project” (at http://www.presidency.ucsb.edu/) with its vast collection of presidential speeches from across the centuries of U.S. history. So, instead of a history lesson, today’s post is a collection of excerpts from many of the Memorial Day speeches various presidents have given. I hope you are as moved by some of these as I was. …This is the special day of the nation’s gratitude, most genuinely felt and most gladly expressed. I do not believe republics are ungrateful. They may sometimes have the seeming of ingratitude, but since republics must be like the citizens who constitute them, we are bound to believe our Republic full of the gratitude which animates our citizenship. …And I like to think of the individual citizen as a veteran of our contending forces in peace as well as a defender in war, who deserves likewise the gratitude of his countrymen. It little matters what war one served in. The supreme offering of life on the altar of American patriotism was the same in every one. No man could offer more. It calls for gratitude unlimited and unfailing. …Yes, we are met in memory of the fallen, but I can not escape the thought that the real compensation comes to the living. The fallen do not, can not know of our remembrance of them, but the living may take to their breasts the consolation that the republic does love and revere, and comfort ourselves in so doing. Just as sure as present-day civilization endures, just so sure will the Americans of next year and the next century and the century after that be meeting gratefully on Memorial Day to pay memory’s tribute to the soldier dead who had served the Republic. Veterans marching near the shadows, but with heads erect and hearts all brave; veterans of middle age, who look back on marvelous achievement and to the future for still greater; veterans of youth, with the seriousness of life mostly before them, starting with the supreme experience—all may go on, assured of a becoming and grateful remembrance, which is chief among the compensations of life. …It is not enough to seek assurance for ourselves. I believe it a God-given duty to give of our influence to establish the ways of peace throughout the world. We cannot guarantee, but we can promote the peaceful adjustment of disputes, we can aid in the establishment of the agencies of peace, we can be influential in committing the world to the triumphs of peace and make hateful to humankind the spoils of war. For those who are the inheritors of a noble estate and a high place in the world, it is a good thing to pause at intervals and consider by what favor of fortune and of ancestry their lines have fallen in such pleasant places. Thus to meditate upon that course of events, which has given them what they have and made them what they are, will tend to remind them how great is their debt and how little is their share of merit. This is the day on which the American people each year acknowledge that they have such a debt. It has been set aside that a grateful nation may do fitting honor to the memory of those who have made the greatest and most voluntary contribution to it. Here about us, in this place of beauty and reverence, lies the mortal dust of a noble host, to whom we have come to pay our tribute, as thousands of other like gatherings will do throughout our land. In their youth and strength, their love and loyalty, those who rest here gave to their country all that mortality can give. For what they sacrificed we must give back the pledge of faith to all that they held dear, constantly renewed, constantly justified. Doing less would betray them and dishonor us. To such a memorial as exists here we can only come in a spirit of humility and of gratitude. We can not hope to repay those whom we are assembled to honor. They were moved by a noble conception of human possibilities and human destiny. But we can undertake to find what was their inspiration and seek to make it our guide. By that they will be recompensed. …Our gathering here to-day is in testimony of supreme obligation to those who have given most to make and preserve the nation. They established it upon the dual system of state government and federal government, each supreme in its own sphere. WE ARE upon the eve of the celebration of the 200th anniversary of the birth of George Washington. It is, therefore, appropriate that our observance of Memorial Day should this year be at this place, so intimately associated with the moral grandeur of the Father of our Country. This national shrine needs no description; the events enacted here require no recounting to the American people. The very name, Valley Forge, swells within us a pride of nationality. These peaceful fields hold a glory peculiarly their own. The sufferings of Washington’s army in that dreadful winter of privation have made this place famous among all men. It was not the glory of battle for which these fields are remembered. No great battle was fought here. It was not the pomp of victory, for no martial triumph was won here. It was not the scene where peace was signed by which independence of a great nation was won. It was not the tombs of courageous men who, facing the enemy, gave the supreme sacrifice for their country to which we bow in reverence. A thousand other fields mark the courage, the glory, the valor, the skill, the martial triumph of our race. Yet the instinct and the judgment of our people after the abrasion of the years has appraised this place as a foremost shrine in the War of Independence and in our Nation. It is a shrine to the things of the spirit and of the soul. It was the transcendent fortitude and steadfastness of these men who in adversity and in suffering through the darkest hour of our history held faithful to an ideal. Here men endured that a nation might live. George Washington and his men at any moment could have accepted the counsels of an easy path to an easy end of their privations. They could have surrendered their ideals to the widespread spirit of despair and discouragement. They could have abandoned their claims to freedom. They could have deserted their hopes and forsaken their faith. Instead, they chose the harder way of steadfast fortitude and for many of death. Here Washington and his little band of hungry and almost naked patriots kept alive the spark of liberty in the lowest hours of the Revolution. They met the crisis with steadfast fortitude; they conserved their strength; they husbanded their resources; they seized the opportunity, which, with the turn and the tide of war, led on to victory. It was a triumph of character and idealism and high intelligence over the counsels of despair, of prudence, and material comfort. This was one of those moral victories that are the glory of the race. Without such victories the life of man would descend to a sheer materialism for “where there is no vision the people perish.” Lacking these high inspirations mankind could claim no distinction higher than the beasts of the field, that sing no songs, dream no dreams, inspire no hope, and grasp no faith. It is this high spirit that we commemorate when we pay our yearly tribute of reverence to those who in all wars have stood steadfast and those who have died in the service of our country. Our citizens in every war have flocked to arms at the call of country. They have responded willingly, because in every emergency they have had up before them an ideal of liberty and the freedom of their country. Some wars in history have been instigated by old and cynical men for cruel or selfish reasons. Some wars have been fought for power and possessions. The ends of some wars could have been more nobly won and more wisely won by patience and negotiation. But war for liberty has endowed the race not alone with the most precious possessions of freedom but has inspired every succeeding generation with that idealism which is the outpouring of man’s spiritual nature. …No one who reviews the past and realizes the vast strength of our people can doubt that this, like a score of similar experiences in our history, is a passing trial. From it will come a greater knowledge of the weaknesses of our system, and from this knowledge must come the courage and wisdom to improve and strengthen us for the future. Numerous are the temptations under the distress of the day to turn aside from our true national purposes and from wise national policies and fundamental ideals of the men who builded our Republic. Never was the lure of the rosy path to every panacea and of easy ways to imagined security more tempting. Peace does not come just because we wish for it. Peace must be fought for. It must be built stone by stone. In the first half of this century we learned that there can be no peace if might makes right–if force used by one nation against a weaker nation is ever permitted to succeed. We have learned that the time to stop aggression is when it first begins. And that is one reason we are in South Vietnam today. Modern weapons and means of communications, even more than common aspirations, have created a single world community. There is no going back. This is the way it will be as far ahead as any of us can see. We can only go forward to help make that community one in which nations respect the rights of other nations and live at peace with one another. For the American interest will be well served if our children grow up in a world of independent nations capable of assuming collective responsibility for the peace. Our interest–and the interest of world peace-will not be served if nations continue to violate the independence of other nations. 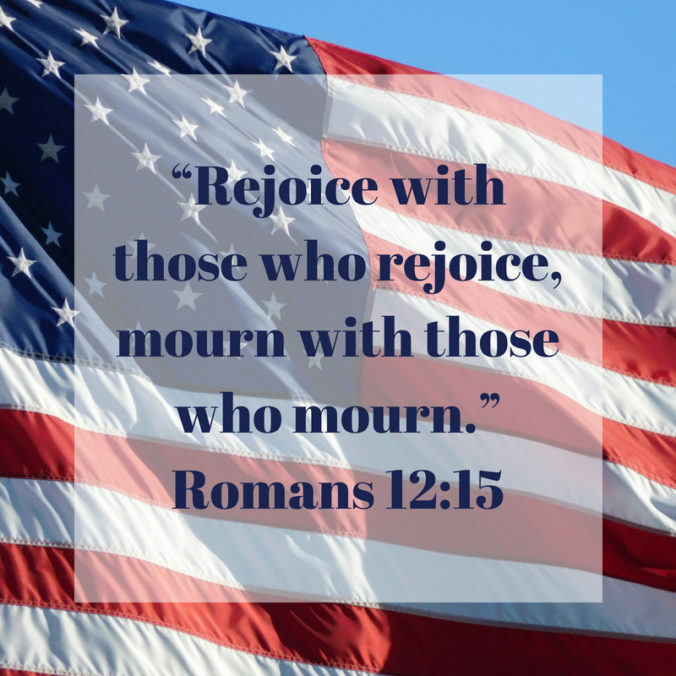 …On this Memorial Day, it is right for us to remember the living and the dead for whom the call of their country has meant much pain and sacrifice. And so today I remind all of my fellow countrymen that a grateful Nation is deeply in their debt. ON MEMORIAL DAY, the American people unite to pay tribute to the many brave men and women who have given their lives in the service of their country. We pause to reflect upon the courage and sacrifice of those who responded when their nation called, who left home and family to take up arms on distant shores to ensure to posterity the blessings of peace and freedom. We render our thanks and express our gratitude, for we have not forgotten what they did or the price they paid. …For the heroism and sacrifice displayed by the American fighting man, past and present, we are indeed filled with pride and gratitude. There is no higher honor or more solemn privilege than to represent our Nation in paying tribute to its honored dead. In this, our 200th year, this day and this hallowed ground take on a very special meaning. As we mark this anniversary of our national independence, we must remember that the Bicentennial celebrates more than a successful political revolution which freed America from foreign rule. The founding of our Nation was more than a political event; it was an act of faith, a promise to Americans and to the entire world. The Declaration of Independence declared that people can govern themselves, that they can live in freedom with equal rights, that they can respect the rights of others. In the two centuries that have passed since 1776, millions upon millions of Americans have worked and taken up arms when necessary to make that dream a reality. We can be extremely proud of what they have accomplished. Today, we are the world’s oldest republic. We are at peace. Our Nation and our way of life endure. We are free. All who come to Arlington this Memorial Day must reflect upon the sacrifices made by those continually brave Americans who lie in rest on these hillsides as beneath silent markers at Valley Forge, Gettysburg, and Pearl Harbor. Their courage won a revolution. Their bravery preserved our Republic. Their perseverance kept the peace and ensured a heritage of freedom. It is through their sacrifice that we have a Bicentennial. It is through their sacrifice that we, the living, have inherited a sacred burden, a trust to honor the past by working for the future. Other nations have risen to great heights only to weaken in their resolve. We must not repeat their error. A nation born of faith and carried forward by action requires from each of us a commitment to advance individual liberty and to maintain our guard against those who would threaten our freedom. Although we thank God that no Americans are dying in battle today, we must renew our resolve to use both our moral leadership and our material strength to keep the peace. Over a century ago another President stood before America’s fallen at Gettysburg and spoke words that have rung through the decades of our history. They are particularly appropriate today. In America’s cities and towns today, flags will be placed on graves in cemeteries; public officials will speak of the sacrifice and the valor of those whose memory we honor. In 1863, when he dedicated a small cemetery in Pennsylvania marking a terrible collision between the armies of North and South, Abraham Lincoln noted the swift obscurity of such speeches. Well, we know now that Lincoln was wrong about that particular occasion. His remarks commemorating those who gave their “last full measure of devotion” were long remembered. But since that moment at Gettysburg, few other such addresses have become part of our national heritage—not because of the inadequacy of the speakers, but because of the inadequacy of words. I have no illusions about what little I can add now to the silent testimony of those who gave their lives willingly for their country. Words are even more feeble on this Memorial Day, for the sight before us is that of a strong and good nation that stands in silence and remembers those who were loved and who, in return, loved their countrymen enough to die for them. Yet, we must try to honor them—not for their sakes alone, but for our own. And if words cannot repay the debt we owe these men, surely with our actions we must strive to keep faith with them and with the vision that led them to battle and to final sacrifice. Our first obligation to them and ourselves is plain enough: The United States and the freedom for which it stands, the freedom for which they died, must endure and prosper. Their lives remind us that freedom is not bought cheaply. It has a cost; it imposes a burden. And just as they whom we commemorate were willing to sacrifice, so too must we—in a less final, less heroic way—be willing to give of ourselves. The willingness of some to give their lives so that others might live never fails to evoke in us a sense of wonder and mystery. One gets that feeling here on this hallowed ground, and I have known that same poignant feeling as I looked out across the rows of white crosses and Stars of David in Europe, in the Philippines, and the military cemeteries here in our own land. Each one marks the resting place of an American hero and, in my lifetime, the heroes of World War I, the Doughboys, the GI’s of World War II or Korea or Vietnam. They span several generations of young Americans, all different and yet all alike, like the markers above their resting places, all alike in a truly meaningful way. As we gather today, it is dawn in America, Memorial Day weekend. And as the Sun rises and the summer begins, the images both here and at home are of countries that are prosperous and secure, countries confident of their place in the world and aware of the responsibility that comes with that place. Soon that lone soldier at Arlington will resume his paces, 21 steps in each direction, the changing of the guard precisely on the half hour. And at Gettysburg, the schoolchildren will scatter flowers on other unknown graves, blue and gray, side-by-side, Americans. On Memorial Day, we give thanks for the blessings of freedom and peace and for the generations of Americans who have won them for us. We also pray for the same strength and moral reserve demonstrated by these veterans, as well as for the true and lasting peace found in a world where liberty and justice prevail. We come together this morning, along with our countrymen and women in cities across the land, to honor those who died that we might live in freedom, the only way that Americans can ever truly live. Today we put aside our differences to better reflect on what unites us. The lines so often drawn between and among us, lines of region or race or partisanship, all those lines fall away today as we gaze upon the lines of markers that surround us on these hallowed hills. The lines of difference are freedom’s privilege. The lines of these markers are freedom’s cost. Today Americans all across our land draw together in shared experience and shared remembrance. And whether it is an older veteran in Florida, or a teenager in New Mexico, or a mother in Wisconsin, all today will bow their heads and put hand to heart. And without knowing each other, still we will all be joined in spirit, because we are Americans and because we know we are equal shareholders in humanity’s most uplifting dream. …In honoring those who died in the defense of our country, we must never neglect to honor as well our living American veterans. The Nation owes a special debt to the millions of men and women who took up posts at home or abroad to secure our defenses or to fight for our freedom. Because of what they have done for us, their health and well-being must always be a cause for our special concern. Here by the Tomb of the Unknown Soldier, we renew our Nation’s solemn pledge also to the POW and MIA families from all wars, a pledge to provide not just the prayers and memorials but also to the extent humanly possible to provide the answers you deserve. And we vow, with the new Korean War Memorial project finally underway, that no future conflict, if conflict there must be, must ever be regarded as a forgotten war. The inscription on the Tomb of the Unknown Soldier says that he is, quote, “Known only to God.” But that is only partly true. While the soldier’s name is known only to God, we know a lot about him. We know he served his country, honored his community, and died for the cause of freedom. And we know that no higher praise can be assigned to any human being than those simple words. Today we are at peace, but we live in a troubled world. From that flag and from these, our honored dead, we draw strength and inspiration to carry on in our time the tasks of defending and preserving freedom that were so nobly fulfilled by all those we come here to honor in this time. In that effort and in the presence of those buried all around us, we ask the support of all Americans in the aid and blessing of God Almighty. Every Memorial Day we try to grasp the extent of this loss and the meaning of this sacrifice. And it always seems more than words can convey. All we can do is remember and always appreciate the price that was paid for our own lives and for our own freedom. Today, in thousands of towns across this great land, Americans are gathered to pay their own tributes. At 3 o’clock this afternoon Americans will pause for a moment of remembrance. They will meet at monuments or in public squares or, like us, in places where those we honor were laid to rest. More than any words we say, the truth is told in the things we see, in markers, in dates, in names around us…Within these 200 acres are the remains of men and women who died young, some very young. Walking along these paths, a visitor to this national cemetery might view these markers as one great national loss, and that is certainly the case. But we must remember, for many who come here, there is one marker that will always stand out among all the others. In their eyes, it lies alone. For one woman, Memorial Day brings thoughts of the father she never knew. 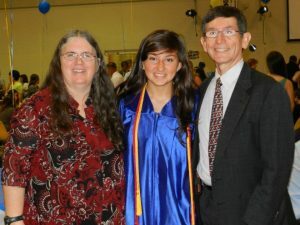 She recalled as, a young child, learning to pray the words “Our Father, who art in heaven,” thinking she was talking to her own father. For others, there is the memory of the last kiss as the train pulled away, a last wink and parting wisecrack from a big brother, a brave smile from a son who seemed like a boy. And then there was the telegram that came. To those who have known that loss and felt that absence, Memorial Day gives formal expression to a very personal experience. Their losses can be marked but not measured. We can never measure the full value of what was gained in their sacrifice. We live it every day in the comforts of peace and the gifts of freedom. These have all been purchased for us. From the very beginning, our country has faced many tests of courage. Our answer to such tests can be found here on these hills and in America’s cemeteries, from the islands of the Pacific to the north coast of France. And on Memorial Day, we must remember a special group of veterans, Americans still missing and unaccounted for from Vietnam, Korea, the cold war, and World War II. We honor them today. They deserve and will have our best efforts to achieve the fullest possible accounting and, alive or dead, to return them home to America. It is not in our nature to seek out wars and conflicts. But whenever they have come, when adversaries have left us no alternative, American men and women have stood ready to take the risks and to pay the ultimate price. People of the same caliber and the same character today fill the ranks of the Armed Forces of the United States. Any foe who might ever challenge our national resolve would be repeating the grave errors of defeated enemies. Because this Nation loves peace, we do not take it for granted. Because we love freedom, we are always prepared to bear even its greatest costs. Arriving here today, all of us passed the strong, straight figures of men and women who serve our country today. To see their youth and discipline and clarity of purpose is humbling to a Commander in Chief. They are the new generation of America’s defenders. They follow an unbroken line of good and brave and unfaltering people who have never let this country down. Today we honor those who fell from the line, who left us, never knowing how much they would be missed. We pray for them with an affection that grows deeper with the years. And we remember them, all of them, with the love of a grateful Nation. … For the parents who have lost a child, for the husbands and wives who have lost a partner, for the children who have lost a parent, this day and this place are solemn reminders of the extraordinary sacrifice they have made in our name. But today reminds us as well that for these family and for their comrades-in-arms, their service to our Nation endures. There are few who truly understand what it means to send a child into war or to watch a battle buddy give his life to save others. On this Memorial Day, and every day, these are the families and veterans we’re sworn to look after. And so here, on these hallowed grounds, we rededicate ourselves to our sacred obligations to all who wear America’s uniform and to the families who stand by them always: that our troops will have the resources they need to do their job; that our Nation will never stop searching for those who’ve gone missing, who are held as prisoners of war; that, as we’ve been reminded in recent days, we must do more to keep faith with our veterans and their families and ensure they get the care and benefits and opportunities that they’ve earned and that they deserve. These Americans have done their duty. They ask nothing more than that our country does ours, now and for decades to come. The fallen patriots we memorialize today gave their last full measure of devotion. Not so we might mourn them, though we do. Not so that our Nation might honor their sacrifice, although it does. They gave their lives so that we might live ours: so that a daughter might grow up to pursue her dreams; so that a wife might be able to live a long life, free and secure; so that a mother might raise her family in a land of peace and freedom. Everything that we hold precious in this country was made possible by Americans who gave their all. And because of them, our Nation is stronger, safer, and will always remain a shining beacon of freedom for the rest of the world. May God bless the fallen and all those who serve. May God watch over their families. And may God continue to bless the United States of America. Words cannot measure the depth of their devotion, the purity of their love, or the totality of their courage. We only hope that every day we can prove worthy not only of their sacrifice and service, but of the sacrifice made by the families and loved ones they left behind. Special, special people. … We can never replace them. We can never repay them. But we can always remember. And today that is what we are doing: We remember. Words cannot wipe away the tears or bring back those smiling faces. But if Americans just take the time to look into your eyes and tell you how much we thank you and how dearly we pray for you and how truly we love you, then hopefully, you can find solace through your pain. And every time you see the Sun rise over this blessed land, please know your brave sons and daughters pushed away the night and delivered for us all that great and glorious dawn. Thank you. God bless you. God bless our fallen heroes. God bless their families. God bless our military. And God bless the United States of America. To say that I am a long-time creationist would be an understatement. 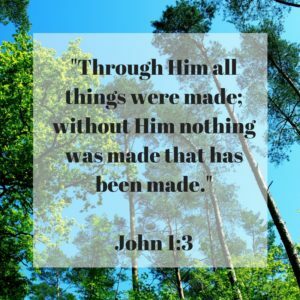 My husband and I listened to our first debate on creation versus evolution decades ago when we were college students. And I have read, watched, or listened to a wide variety of creation resources over the ensuing forty plus years. Needless, to say I’m a big fan of Ken Ham’s work with Answers in Genesis. Every trip has been a little bit different, of course, but every one of them has been worthwhile. On this most recent trip, we did the Ark Encounter first. It was the second time my daughter and I had been, and we had the privilege of introducing four others to it (two teens and two older adults). As expected, a good time was had by all. And there is something awe-inspiring about seeing a life-size ark, and then going inside and imagining (with the help of some wonderful creative effects) how Noah’s family and all those animals would have lived and worked in such a space for over a year. The exhibits at both museums are extremely well done – from both a visual aspect and an information one. Since my daughter and I had been before, we were able to focus on some of the exhibits that we had only glossed over the first time, as well as enjoying several that were new since our first visit. Because there is so much to see there, it is most definitely the type of place that begs for a return visit (or 2 or 3 or …), hence the beauty of a membership. It’s just really hard to take it all in at one time. Additionally, I strongly recommend against trying to do both the Ark Encounter and the Creation Museum in one day. I met a couple as we were finishing the Ark who had done them both that day, and it made me tired just listening to them. There is so much to see and do at both places that I cannot imagine doing that – there would be no way to fully enjoy both places if you were trying to cram them both into the same day. Population: What we know versus what we can only deduce. And at the Creation Museum, be sure to include a planetarium show if at all possible. We have watched one almost every time we have been there, and never get tired of them – with our favorite being Created Cosmos. The absolute best option is to get an annual combo pass so that you can go to both the Ark Encounter and the Creation Museum two or more times in a twelve month period. Next best is to get a ticket that includes both – and go to one on one day and the other one on the next day. We actually did one on Tuesday and one on Thursday on our last trip, and visited the Newport Aquarium in between the two. No right or wrong way to do it! 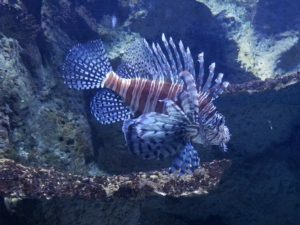 Even the diversity of the fish at the aquarium tell the story of Creation. And, if you just can’t work in the time or the money for both, you can’t go wrong with either. The friend I took this last time enjoyed the Ark more – feeling like she was “encountering Noah and the Flood” in an entirely new way there. 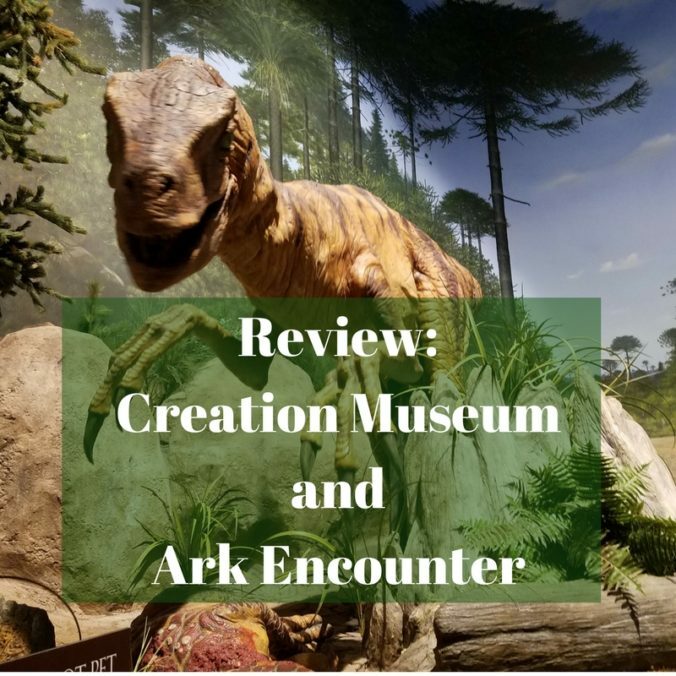 But, the Creation Museum might be my choice for just one, because it covers such a broad array of topics within the area of creation, including a small exhibit on the ark. But again, neither would be a bad choice. 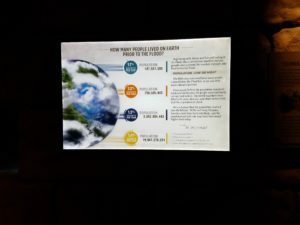 This is part of what I like throughout the beginning of the Creation Museum – the explanations of Present vs. Past. Both places have restaurants that you can eat at if you are there over a meal (we usually are) and don’t want to pack a picnic (we usually can’t). The restaurant at the Ark became a buffet between our first and second trips there, which made it a little more expensive than we had planned on, but it was actually an exceptional meal, so in the end we all decided it had been worth it, and we will gladly eat there again on future trips. Whether you are “in the area” or have to make a special trip to the greater Cincinnati area for these, I strongly encourage you to work these into your trip. 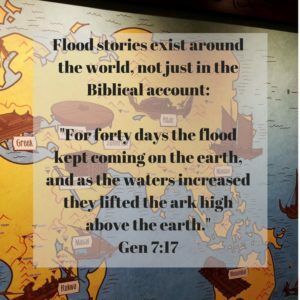 If you want to share good, solid Creation information with your students or family, or just want to increase your own knowledge, you can’t go wrong with the Ark Encounter and/or the Creation Museum. 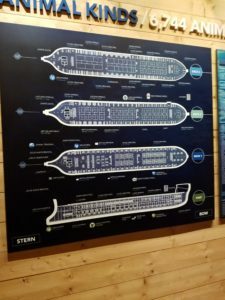 Each place has done an exceptional job of bringing together great displays with good information, in a family friendly location, suitable for children and adults alike. 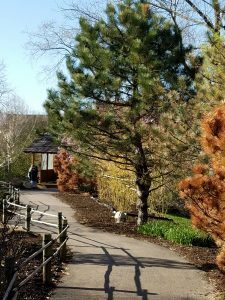 There are inside portions, and weather permitting, some nice outside portions at both as well – including a petting zoo and nice botanical gardens. 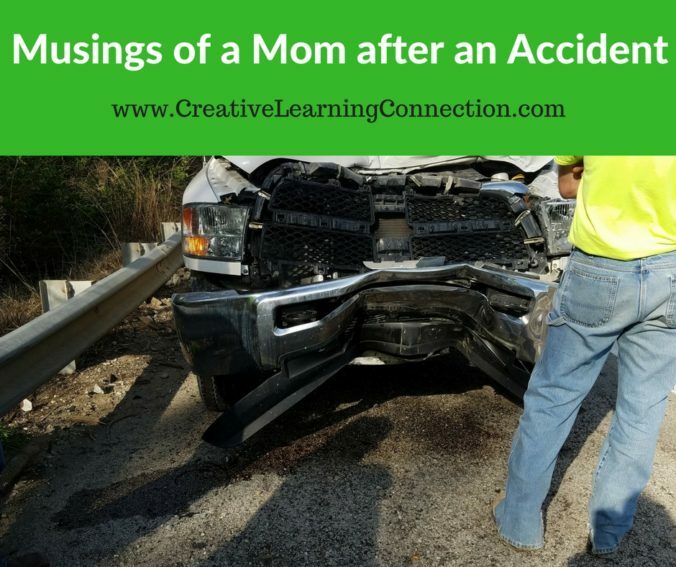 And there’s nothing like being involved in a car accident to make a mom think about such things again, even years after they’ve all learned to drive. More on last week’s accident in a moment; for now, suffice it to say, that miraculously, we all walked away from it without injuries. After watching each of my children move from being a non-driver, to a new driver, to an experienced driver, I now believe that teaching them the mechanics of driving was the easy part. But, I pray, especially after this most recent accident, that they’ve all become not just adequate drivers, but also safe drivers. I’m convinced that the longer we drive, the less we tend to think about how much more goes into being safe on the road than just knowing how to drive. Last Wednesday evening we got caught in rush hour traffic as we returned to Louisville from a day trip to the aquarium near Cincinnati. Too many other cars were trying to exit the interstate at the same exit we were supposed to be getting off at, and the traffic in our lane slowed down until it had come to a complete halt. We stopped; the small vehicle behind us stopped; the SUV behind it stopped; the 18-wheeler did not; nor did the pickup truck behind it. Within minutes the vehicular dominoes had fallen, and all five vehicles, and the twelve people within them, were no longer heading anywhere. Amazingly, there was no loss of life. In fact, all twelve of us climbed out of the various vehicles without a scratch. But there were other consequences. 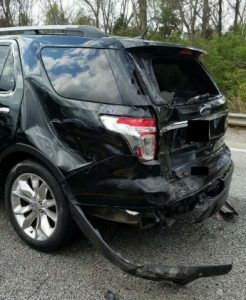 Our vehicle was totaled. 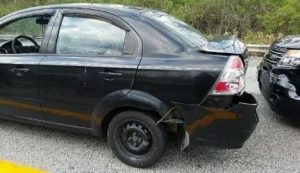 The small car that hit us was definitely totaled. The SUV behind him sustained quite a bit of damage in both the front and the back, but was a relatively new vehicle, so I don’t know what will happen with it. 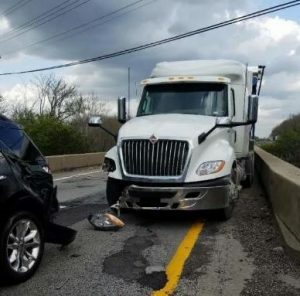 And then there was the damage to the 18-wheeler and the pickup truck; thousands of dollars more damage to those two, I’m sure. One way or another I suspect that the insurance companies will eventually take care of some sort of payments for all of that. But will those of us with the two smaller cars be able to replace our vehicles for the money that we receive if they are considered totaled? It is highly unlikely. On moment we had good, functioning vehicles, and the next moment we did not. How do the insurance companies make that situation right? By writing us checks for a small portion of their true value? In just moments the evening plans of a dozen people turned upside down. Though, again, we were all very thankful that it was plans and not lives that were ruined. We were headed back to a friend’s house, looking forward to an early dinner and a quiet evening (doing things like writing a very different blog post!) The young man in the car behind us was heading home from work, and was a mere five minutes from his house when his car was struck. The SUV contained a family of four, on their way to basketball practice for the two teenage girls. And so it went on down the road. None of us thought we would be spending more than two hours by the side of the road that evening, giving statements to the police, and then eventually waiting for our mangled vehicles to be towed away. And as I go over the accident in my mind, I wonder once again, as I have since my children started learning to drive more than twenty-five years ago, have they learned the driving lessons they needed to learn? And what would I consider the most important ones for them to remember? With as many older cars as we’ve owned – will their cars be safe and not have problems that cause an accident? Happy New Years to all of you! I hope you are each ready for 2018 – I’m still trying to figure out where 2017 disappeared to. I might have skipped today’s blog post, but it’s already been almost a month since I last posted one on this site, so I thought it would be better to do a “short” post rather than wait another couple of weeks! 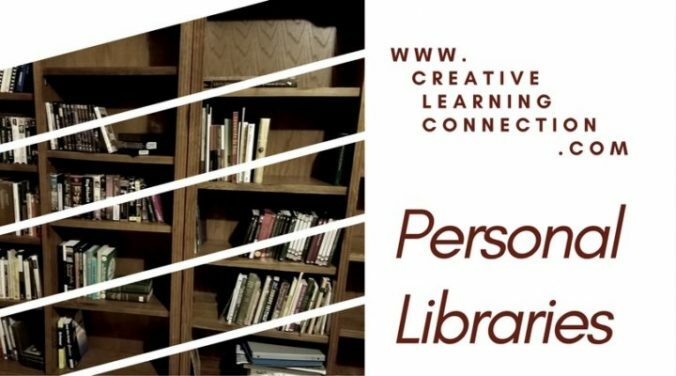 Do you have a Personal Library? But, before I get into more about that, I would like to ask – how many of you have personal libraries? Since most of the readers of this blog are homeschoolers, I hope that most of you can answer yes to that question! I realize that here in the twenty-first century we live in a digital world that didn’t exist when I started homeschooling over thirty years ago, but there is still something very special about “real” books that sit there on a shelf, reminding you they are there and that they are meant to be used. And as a homeschooler, I really can’t imagine not having had a personal library all those years that I was educating my own children. We happily moved thousands of books across the world and across the country as the Army moved us from place to place. In fact, when we were heading stateside from Germany, we started to worry about our weight limit, and we were willing to get rid of furniture if need be, rather than get rid of any of our books. 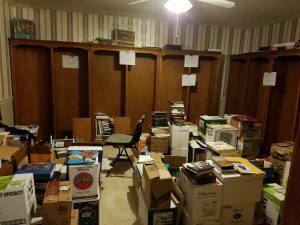 My best guess puts my library at about 7,000 books when we moved into our current home and converted the “formal dining room” into a library. My husband graciously filled three of the four walls with wall to wall, floor to ceiling bookshelves. As my homeschooling came to an end, I started trying to purge my books, though I don’t think I’ve managed to shrink my current holdings to much under 5,000 books. When I closed my physical store at this time last year, we chose to keep more than a dozen of the bookcases that had graced the walls of Creative Learning Connection for the previous decade. But for the last year the shelves have sat in our storage unit awaiting the time and energy to put them back to use. So several weeks ago I decided the time had come to bring the brown bookcases over and replace the white shelves that had served our needs for so long. It was mid-December and company and holidays were just around the corner – but my son had some time off between semesters and I wasn’t going to get a better opportunity to do this! To increase the chances we wouldn’t change our mind – I scheduled someone to come clean our carpets on December 15. So we were committed. We had to remove thousands of books, so that my son could then remove the dozens of shelves that were already there. Several students helped remove and box some of the books on Wednesday, and Thursday three of us worked until late into the night (or early into the morning) to finish the task. But we did it! We cleared out the room, the carpets were cleaned and the following week we were ready to reverse the process. 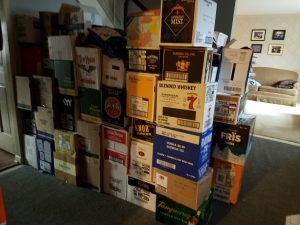 It’s a good thing the Liquor store gives away free boxes! This is NOT all of the boxes either. Of course, removing the books and the shelves was actually the easy part. The next week, the fun really started. I determined I had space for seven bookcases in the library. The problem was that our brown bookcases were actually two different styles – so in order to get seven that matched, we had to get three of them from the storage unit, and then also trade for the two in the office and the two that were in my second floor bedroom. And, of course, the four that were already in the house were already full of books and/or games! So before those could be moved they had to be emptied. My son and two of his friends brought over the bookcases we needed from the storage unit (including two to replace the ones in the office – the bedroom replacements will have to wait until this part of the project is completed.) Meanwhile my daughter and I were removing books and games as quickly as we could. I think this is where we were in the process a week ago. We’re not where I had hoped to be by today, but we’re getting there. I have knee surgery scheduled for January 10, so finishing before then is the new target. (We’ve already missed the before Christmas company deadline.) In the meantime, we try not to trip over the stacks of boxes and books that really are shrinking! I don’t attend many movies in a theater – it’s generally cheaper and quieter to watch them at home. (And then I have the added benefit of being able to multitask!) The first eleven months of 2017 I saw four movies in a theater (three of them were historical fiction and one, I admit, was absolutely just for fun). But if all goes as planned, I may see four more during the month of December. Last week, three of my daughters and I went to see Wonder in a theater. I had known nothing about it, until someone in an on-line writer’s group I’m in mentioned it, almost in passing. Fortunately I then watched a trailer for it, so I knew to bring Kleenexes – lots of Kleenexes! Without giving too much away (because I hate those types of reviews) I will say it’s a movie I think almost anyone would enjoy seeing. And if there were more movies like this being made, I would probably take the time to see more of them! The main characters are a 5th grader, his 9th grade sister, and their parents. The 5th grader has a rare genetic disease, Treacher Collins Syndrome, that has resulted in him having more than two dozen surgeries – to correct major facial deformities. As a result, he has been homeschooled through 4th grade and is about to attend “real” school for the first time. Needless to say, some serious bullying goes on when he starts school (because of the deformities and the homeschooling). So why do I like the movie so much? It portrays homeschooling in a positive way. The mother at one point says “I can’t homeschool him forever” which I might disagree with but the overarching message about homeschooling is still extremely positive. The importance of family and family values, as well as getting through family struggles, is shown throughout the movie – sometimes in surprising ways. If you have a problem with interracial couples, you won’t like this. If you are okay with bullies and parents who encourage bullying, same answer. Ultimately, my crying notwithstanding, this a “feel good” type movie – once everything and everyone gets straightened out. But along the way, the author did a great job telling a compelling story and it was actually made into a good movie. I have it on good authority that the audio book version of Wonder is also good, but alas, I didn’t find time this last week to listen to it. Maybe one of these days! So, in summary, if you’re looking for a good family-friendly movie, I strongly recommend Wonder. And I would love to hear what you think about it after you see it. Here are some of my absolute favorite quotes on education and learning, from a variety of sages across 2500 years. You may not agree with the sentiment of each of them, but my guess is they will all make you think! Did I leave out any of your favorite quotes? First, I want to start with a quote that the author, Mr. Reinke, used from Charles Spurgeon: “The easiest work in the world is to find fault.” Mr. Reinke used that quote in the context of Chapter 11 – “We Become Harsh to One Another.” My goal is not to just find fault with Mr. Reinke’s book – I do have some positive things to say about it. But I also want to turn this quote back on the book as a mirror, because ultimately that was my biggest complaint with this book – I felt like much of it was just the author finding fault with smart phones and smart phone users. Before I go further with my review, let me back up to why I found myself reading/listening to this book, and why I am offering this review on my homeschool website. One of our church elders likes to tell us about good non-fiction books that he has discovered. I often read his recommendations and generally like them and learn from them. Last week’s recommendation was another interesting-sounding title that I wasn’t familiar with – 12 Ways Your Phone is Changing You. I did what I do with the majority of books that catch my interest – I went to Audible and got the audio version of it – so I could listen to the book on my phone. I’m still mulling over the irony of that decision for this particular title, but I knew it was the best way for me to get to the book sooner rather than later. Because I listened to the book, I can tell you approximately how much time I initially spent with the book – just under seven hours. Was the book worth seven hours of my time? Definitely. Was it worth the price(s) that I paid? Yes, I would say so. Did I agree with everything the author wrote? Not even close. But that isn’t ultimately my measure for whether a book was worth reading (or listening to). I think the author makes some really good points about the way cell phones have invaded our lives in these modern times. But I cannot agree with much of what he says, as hard as I might try. The introduction was a little lengthy, but overall I liked his “Theology of Technology.” It’s good to be reminded that technology is not a new thing, nor strictly speaking a human invention. We have to give God credit for giving us the ability and the raw materials with which to invent things. The breakfast area in our hotel this weekend might be showing us how far we’ve come with our addictions to our phones as a society! It is also good for all of us who use smart phones to evaluate how we use our phones, or as the book’s description puts it “Do you control your phone or does your phone control you?” And the author does give many suggestions for how to determine that. Another quote from the book that I agree with: “I do not have ‘time to kill’ – I have time to redeem.” This is a good thing for Christians to remember, particularly in regards to our use of technology. Putting that quote on our smart phones and our laptops would probably be a good reminder as we make decisions throughout our days. Additionally, it is good to remember that Jesus commanded us to love God and to love our neighbors. How we use the tools in our life certainly fall under those commandments. I do agree with that fact, though I often got the impression that the author was balking at the idea that we could use our smart phones in the obedience of God’s commandments. I think the author paints with too wide a brush. He describes extremes of smart phone usage as if that was the norm. And while I know there are many who do abuse the use of their phones, I don’t believe it to be the case that the majority do. I’m spending the weekend out of state with my sisters and our mother. (We’re attending a family reunion tomorrow.) We’re all smart phone users to some degree (my mother, who is in her 80s, is much less so, not surprisingly), but I think it’s fair to state that none of us our controlled by our cell phones. All three of us have children and grandchildren around the country and around the world. As a result, we all use our cell phones as a primary form of communication with them. No, we don’t necessarily use our devices to TALK to them, but we use texting, emailing, and WhatsApp to keep in touch with them. Most of our photo and video sharing is to keep up with the same kids and grandkids. 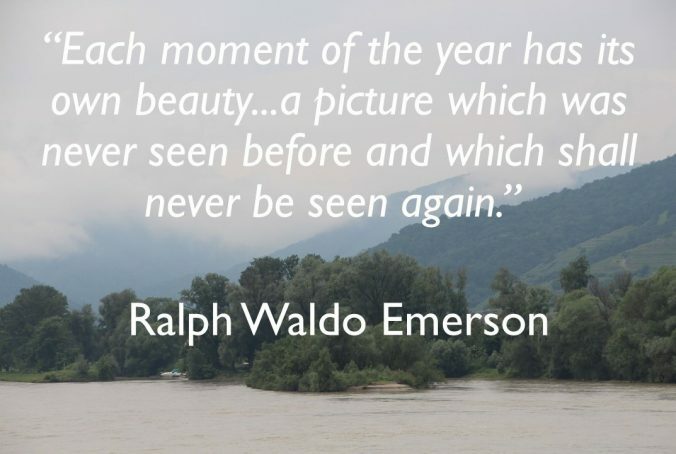 While memory might be great for something you experience yourself (a point the author made when he seemed to dismiss the value of most digital photography), these videos and photos are what keep us in the loop with our families, and are something we are all extremely happy to have. So, in answer to his question towards the end of the book, what should we do with our phones, rather than what can we do, for us as grandmothers and mothers, using them to help us keep connected to our families certainly falls in the should category. Do I Recommend The Book? I do believe that for many of us, smart phones are a legitimate tool for many of us to use in our daily lives. Does my morning routine involve my cell phone? Yes, I willingly admit that it does. I check my emails, texts and WhatsApp almost as soon as my alarm goes off. (My phone has been on silent all night, and with family all over the world it is not infrequent to awake to messages.) I glance at my recent emails that aren’t from family, but seldom respond to them at that time, since I’m generally getting ready to get out the door for swimming. If I’m by myself, I generally turn on music or push play on one of my current Audible books. One of those will generally be on until I join other family members or get where I’m going (again, many mornings I’m heading straight to the pool). My personal rule – I don’t listen to my phone when I’m around others, unless we are listening to something together. I seldom deviate from that rule! Later in the day my phone gets used for communication, research, my calendar and to do list, and only rarely do I get on Facebook (usually to catch up with family members, or currently, to check in with a writers group that I’m involved with). I don’t play games, seldom watch videos, or do any of the other things Mr. Reinke mentions. Could I use other devices to set my alarms and do all of the above things? Sure. But why would I want to? Just like the laptop that I do most of my writing on, my phone is a very useful tool. I appreciate the ways that it can streamline my life. I will make no apologies for that. If my use of it becomes problematic, I will certainly reconsider, but at the moment, I am comfortable with my cell phone usage. But again, everyone who uses a smart phone would be well served to periodically do a reality check of how that usage is going. This book could a good tool to help make that check. This time of year weddings and graduations are often on people’s minds. Add Mother’s Day and in families like ours, several birthdays, and it can be a month centered around celebrations. Which isn’t such a bad thing, if you ask me. My Mom and my Daughter-in-law were both in town for Mothers Day 2017. What a treat. This year was an unusual one for us – there actually were no weddings in our immediate family (though two of my five married children had their weddings in past months of May) and there were no graduations (also unusual, since between high school and college graduations we’ve also done quite a few of those in previous Mays). But we still had our share of birthdays, including my youngest son turning 21. And it was fun to celebrate Mother’s Day this year with three mothers in the house (me, my Mom, and one of my daughters-in-law). One of our many, many high school graduations (this one in 2012). With three mothers in the house this year, flowers were in abundance! Celebrating another birthday at our house – this one Eli’s 21st. What are some of your favorite quotes for birthdays, weddings, graduations, or Mothers Day? Please share. 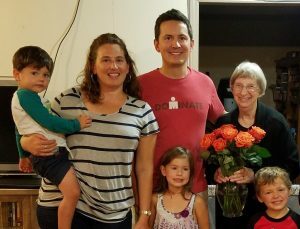 Cathy (Mom of 12) – which means lots of celebrations! Creative Learning Connection (Catherine Jaime) is a participant in the Amazon Services LLC Associates Program, an affiliate advertising program designed to provide a means for sites to earn advertising fees by advertising and linking to Amazon.